I’ve updated my Streaming Guide to Short-Lived & Forgotten TV Shows. It covers nine streaming services, including Amazon Prime, Hulu, Netflix, and more. 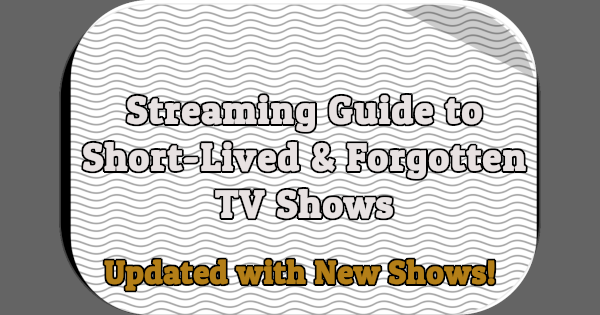 I’ve updated my Streaming Guide to Short-Lived & Forgotten TV Shows. It now covers nine streaming services, including ABC and NBC plus Netflix, Amazon Prime, and more. This month’s Spotlight is The Second Hundred Years, an ABC sitcom from the 1967-1968 season starring Monte Markham and Arthur O’Connell. This month’s Spotlight is on The Boys, a short-lived sitcom starring Bonnie Hunt, Holly Wortell, Don Lake, Tom Virtue, Richard Kuhlman, and Mike Hagerty. It ran on CBS for five weeks during the summer of 1993.